Eddie Hearn announced the latest signing to his burgeoning Matchroom Stable yesterday, when Ellesmere Port’s highly regarded former IBF Bantamweight Champion, Paul Butler, moved over after spending his entire career under the Frank Warren Promotions banner. He goes straight into a main event slot at Liverpool’s Echo Arena on September 30 when he rematches Darlington’s Stuart Hall, the man he won the IBF Bantamweight Title from in a tight split decision win in the summer of 2014. The bout is an eliminator for the WBA version of the World Title. Jamie McDonnell, the current Champion, has a rematch of his own against Liborio Solis, following a closer than judged wide points win in Monaco last year. Butler has found himself frustrated and pushed way down the card in his most recent appearances on Frank Warren shows. Having turned professional in late 2010, Butler quickly made waves in the Super Flyweight division. He swiftly moved to 7-0 and stepped up in his eighth fight by beating the previously unbeaten Ashley Sexton on points at the York Hall in July 2012. This win lead to a shot at the vacant British Title, which he won in emphatic style by stopping fellow Liverpudlian John Donnelly inside the first round at the Liverpool Olympia. Two fights later, Butler captured the Commonwealth crown, stopping Yaqub Kareem in five rounds. After a stunning knockout Commonwealth defence against Najah Ali, Butler moved onto the World scene, picking up WBA and WBO Intercontinental Titles at Super Flyweight, before knocking out Oreste Bernabe Nieva to lift the WBA Intercontinental Title at Bantamweight. This set up a tilt at Stuart Halls IBF World Title in Newcastle in June 2014. In a tight fight, where a lot of the rounds were tough to score, Butler became World Champion in only his sixteenth fight via split decision. Butler decided to return to his preferred weight, and after a warm up win over Ismael Garnica, “The Baby Faced Assassin” challenged the gifted South African Zolani Tete for his IBF crown at Super Flyweight. In a match Butler was favoured to win, he was stopped in the eighth round with Tete well on top, a brutal uppercut ending matters. So the move to Matchroom has now been confirmed, and this represents a number of opportunities for the likeable Butler. As he can easily float between weights, a big domestic fight with WBA Super Flyweight Champion, and Matchroom fighter, Kal Yafai could be a possibility in the future. At Bantamweight, Northern Ireland’s Ryan Burnett recently won the IBF Title by outpointing Lee Haskins in Belfast. The other Champions at the weight are currently Ricky Hatton trained WBA (Super) Champion Zhanat Zhakiyanov, Shinsuke Yamanaka, the WBC Champion, and Zolani Tete, who has now moved up, and is the WBO champion after outpointing Athur Villanueva in Leicester in April. 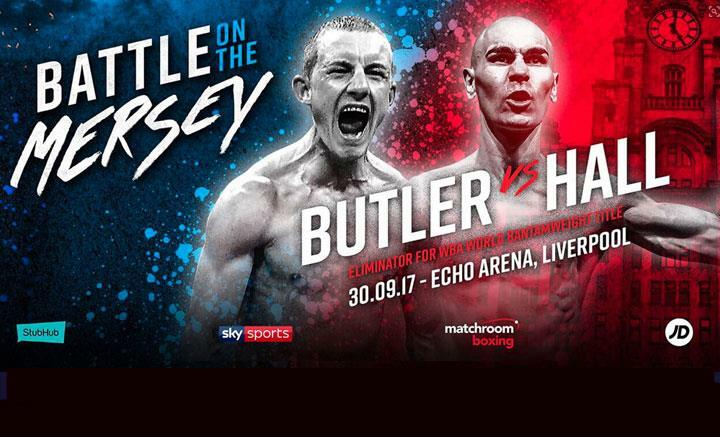 It’s good to see that Butler moves straight into a big main event fight in his home city, and he’ll be intent on putting on a show for his new employers in front of the Sky Sports cameras. I expect him to beat Hall slightly more convincingly this time, and likely have to go the distance to do so.